Is Russell Wilson, charismatic quarterback for the Seattle Seahawks, about to start making plays for a big challenger to the hometown team? We’re not talking about a football rival like the San Francisco 49rs or the New England Patriots. This would be a rival to Seattle-based e-commerce juggernaut Amazon — China’s giant e-commerce company Alibaba. 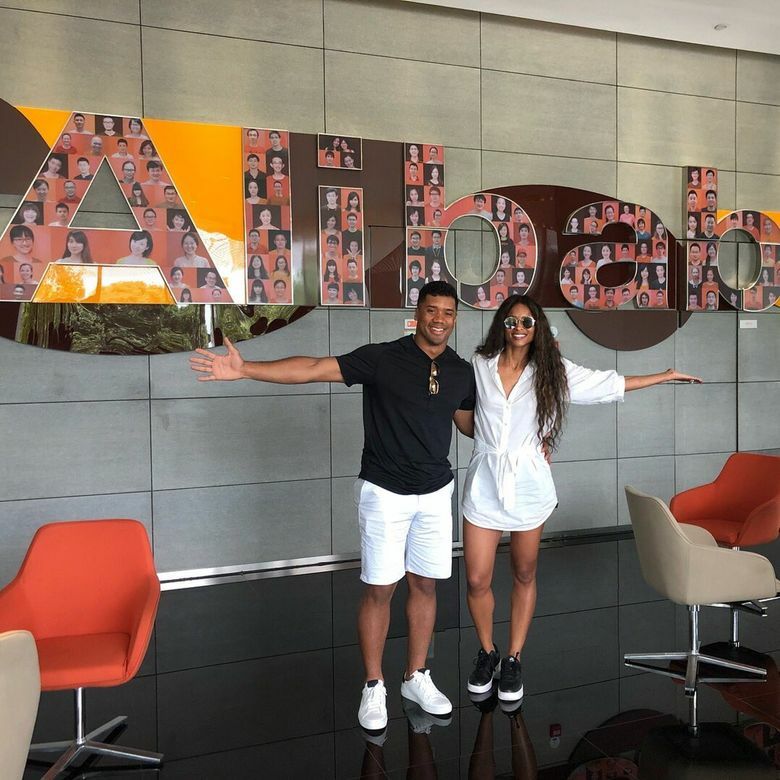 In videos he posted Thursday, Wilson and his wife Ciara are shown visiting Alibaba headquarters, munching on various foods in a local market and mugging for the camera. “China! It’s been real and amazing. Thanks Alibaba! Can’t wait to do some groundbreaking things,” he tweeted. In the video Wilson makes a point of how he’s using mobile payments on his phone to buy items at the market after scanning a QR code on the sales counter. The Alipay mobile payment system is operated by Alibaba affiliate Ant Financial, which is also based in Hangzhou. Last month, Ant raised $14 billion — yes, with a B — from domestic and U.S. investment funds, and will use that money to accelerate its globalization push, according to S&P Global Market Intelligence. The industry website Payment Source reported that after its attempt to buy Texas-based MoneyGram was blocked in January by the Committee on Foreign Investment in the United States, Ant has focused on establishing links with U.S. payment processors so the millions of Chinese tourists, students and working professionals in the U.S. can use Alipay at American merchants. Wilson could be a strong celebrity spokesman in helping spread awareness and acceptance of Alipay in the U.S. — if that is his game plan. One of his tweets on the Alibaba visit logged more than 53,000 viewers in less than a day. Interestingly, Wilson’s off-the-field ventures include a celebrity news website and app called TraceMe whose backers in a $9 million funding round last fall included both Amazon.com chief Jeff Bezos and Joe Tsai, co-founder of Alibaba. Wilson has plenty of other endorsement deals, ranging from Alaska Airlines and Microsoft to Bose, Braun and Duracell, according to Forbes. He could not be reached, and a Seahawks spokesman did not immediately respond to a request for comment. Alibaba has not gained much of a foothold in American e-commerce, although it has invested in U.S. online merchants and has a Bellevue development office that according to LinkedIn listings has more than 80 employees. But its global ambitions are no smaller than Amazon’s, and both companies recently have been spending billions as they sharpen their competition over markets in Southeast Asia and India. Rami Grunbaum: 206-464-8541 or rgrunbaum@seattletimes.com; on Twitter: @rgrunbaum.